Pouilly-Fuissé will soon have 22 premiers crus. Settling behind the table at Lure Fishbar in New York on a cold night in early January, fourth-term Union des Producteurs de Pouilly-Fuissé president Frédéric-Marc Burrier was jovial. A few months earlier, his general assembly had voted an overwhelming 94 percent in favor of establishing the Pouilly-Fuissé premiers crus classification project. France's Institut National de l'Origine et de la Qualité (INAO) would have accepted the vote on the proposal from the 20-member board of directors, but Burrier wanted the support of the majority of growers. "It was probably my destiny because in 2003, the growers asked me to be president," says Burrier. "But I couldn't put [premier cru classification] on the table right away." 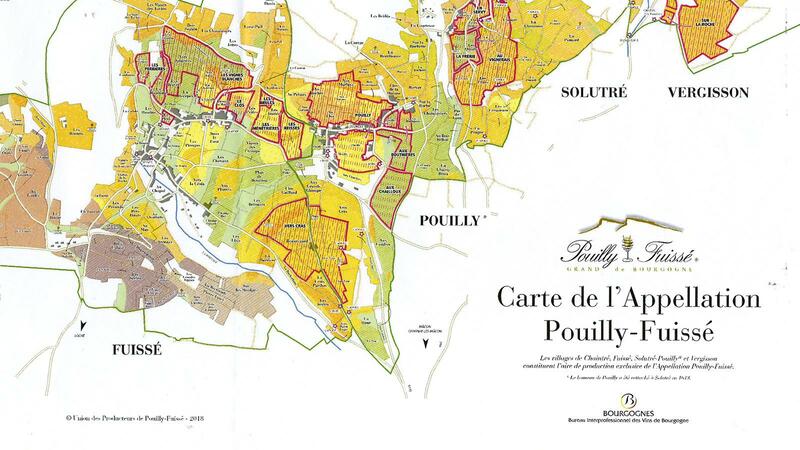 First, a serious study of the Pouilly-Fuissé area—including geology, topography and history—had to be made, and there had to be a map of the appellation's 217 lieux-dits. Then the application was submitted to the INAO. This process has already taken 10 years, but most important, Burrier had to convince the growers, some of whom farm less than 5 acres and may be excluded from the final classification, that this was the path forward for Pouilly-Fuissé. There was no heritage of vineyard hierarchy in the Mâconnais. "This will be my last [term], but I want to see this project through," he laughs. For the next two months, a petition process will hear any grower complaints, after which any final adjustments will be made to the 22 premiers crus boundaries before final approval from the INAO. Burrier also owns four estates in Pouilly-Fuissé, Mâcon and Beaujolais. Château de Beauregard, founded by his great grandfather in 1854, is the main property. It now totals nearly 90 acres, including 17 acres in Beaujolais. In 2003, he bought the 9-acre Domaine Georges Burrier from another branch of the family. In 2007, he created the Joseph Burrier estate to encompass 12.35 acres in the Beaujolais crus of Chiroubles, St.-Amour, Julienas and Morgon. He contracted the 7.5-acre Clos du Château, a historic estate in Pouilly in 2012, and will make the wines and sell them under the Joseph Burrier label. Two years ago, Burrier entered an agreement to manage Domaine de la Rochette, with 20 acres of Chardonnay, the oldest vines dating from the 1950s, mostly in Mâcon-Milly-Lamartine and a smaller portion in Mâcon-Bussières. After working for Louis Jadot from 1988 through 1999, Burrier took the reins of Château de Beauregard from his father. He was fortunate to have old vintages dating back to the 1920s to taste the history of winemaking at the domaine. "I understood the process from these wines my father and grandfather made," he says. The Beauregard holdings encompass 100 different parcels around the Pouilly-Fuissé appellation. Once the premiers crus status is approved, Burrier will label six: La Maréchaude, Les Crèches, Les Menetrières, Les Reisses, Vers Cras and Vignes Blanches. There is a transparency in Burrier's wines that transmit their place. His shepherding of the premier cru classification for Pouilly-Fuissé, the first of its kind in the Mâconnais, will provide an opportunity for the best of the appellation's sites to shine and give the area greater recognition. That's a nice legacy for his 16 years as president.